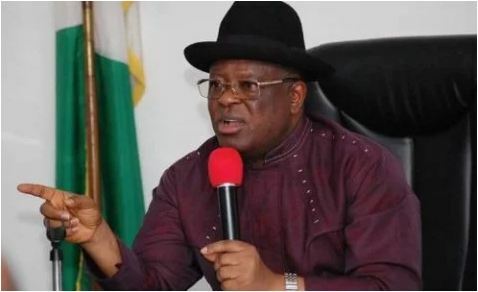 The governor of Ebonyi State, Chief David Umahi, on Wednesday urged the government of Benue State not to allow the activities of hoodlums in their area to plunge the two states into crisis. Umahi made this known while interacting with the acting governor of Benue State, Engr Benson Abounu and other delegation who stormed Ebonyi to pay the state a condolence visit resulting from the alleged killing of six persons by Benue people, which took place at government house Abakaliki. Umahi, represented by the deputy, Barr. Kelechi Igwe, lamented that the alleged gruesome murder of six innocent Ebonyi farmers recently was unacceptable by the state government and called on Benue state to ensure that the perpetrators are brought to book. He stated that the boundary dispute between the two states has lasted for over twenty years but frowned that the crisis was always renewed by citizens of Benue State, who stormed Ebonyi to maim and kill its citizens. “These hoodlums are causing mayhem and at the end of the day. I am sure that at the end of this condolence visit, we will take at least 20 minutes to sit down and talk to ourselves on the need to once again maintain peace and order at that boundary corridor” he stated. He further sympathized with Benue state government over the gruesome murder and maiming of their citizens by suspected Boko Haram and herdsmen who allegedly invaded their state. “We pray that the activities of Boko Haram and herdsmen should stop in Benue State,” he added. Responding, the Benue state delegation led by the Acting governorm Engr. Benson Abounu, said the purpose of their visit was to condole with Ebonyi State government over the recent killing of their citizens by some hoodlums suspected to hail from their state. He, however, made a cash donation of N2million naria to the families of the victims and pledged the commitment of Benue State to ensure that the two states live in peace.